Baobab is the common name for any of the deciduous trees comprising the flowering plant genus Adansonia, a taxa of eight extant species native to Madagascar, sub-Saharan Africa, and Australia. Baobabs are often of enormous girth and store water inside their swollen trunks. Other common names include boab, boaboa, bottle tree (for their capacity to store water), and monkey bread tree (the soft, dry fruit is edible). The baobab is occasionally known colloquially as "upside-down tree," an appearance seen in those trees with a few root-like branches at the very top and a bare trunk going into the ground, particularly during seasons when there are no leaves. It is cited in an Arabic legend in which the devil pulled out the tree and planted it upside down. 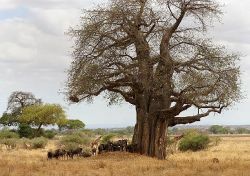 It is also cited in older African lore: after creation, each of the animals was given a tree to plant and the hyena planted the baobab upside-down. The sheer massive size and unique form of baobabs add to the human enjoyment of nature. However, these trees also provide numerous practical benefits as well. The leaves are consumed as leaf vegetable, the gourdlike fruit is very nutritious and used directly or mixed with other foods, and the seeds are used in a variety of means, including roasted for direct consumption or used for their vegetable oil. Baobabs have been used by indigenous peoples as a source of water, and rope and cloth are made from the fibrous inner bark. Baobabs also are used medicinally, and large trees, with their soft, spongy, and light wood, are even hollowed out for dwellings. Ecologically, besides being a food source for insects, they also provide a source of food and water for elephants in Africa. Baobabs belong to the mallow family, Malvaceae, a taxon of flowering plants containing over 200 genera with close to 2,300 species (Judd et al. 2002). Most species are herbs or shrubs but some trees (such as baobabs) and lianas are present. Leaves are generally alternate, often palmately lobed or compound and palmately veined. The margin may be entire, but when dentate a vein ends at the tip of each tooth (malvoid teeth). The stems contain mucous canals and often also mucous cavities. The flowers are commonly borne in definite or indefinite axillary inflorescences, which are often reduced to a single flower, but may also be cauliflorous, oppositifolious, or terminal. There are five imbricate petals and the stamens are five to numerous, connate at least at their bases, but often forming a tube around the pistils. The pistils are composed of two to many connate carpels. The ovary is superior, with axial placentation. The flowers have nectaries made of many tightly packed glandular hairs, usually positioned on the sepals. 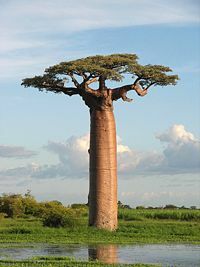 Adansonia (the baobabs) is a small genus within Malvaceae, containing only eight extant species. Six of these species are native to Madagascar, with one species each in sub-Saharan Africa and Australia. The mainland African species also occurs on Madagascar, but it is not a native of that country. Adansonia species reach a height of five to twenty-five meters (ten to eighty feet), with exceptional trees reaching thirty meters (100 feet). 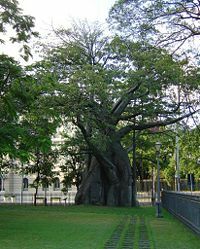 The trunk diameter can be particularly impressive, with a diameter often of seven meters (23 feet), and exceptional trees having a diameter over eleven meters (thirty-six feet). These are among the stoutest trees in the world. A specimen in Limpopo Province South Africa, often considered the largest example alive, is said to have a girth (circumference) of 47 meters (155 feet) and an average diameter of 15 meters (forty nine feet) (Daily Mail 2007). However, comparison of girth and diameters of baobabs with other trees is difficult, because trunks of baobabs change in size at various times during the season due to the storage of water. Baobabs store water inside the swollen trunk, up to 120,000 liters (32,000 US gallons), an adaptation allowing them to endure the harsh drought conditions particular to each region (Moiselet 1998). All baobabs occur in seasonally arid areas, and are deciduous, shedding their leaves during the dry season. Some are reputed to be many thousands of years old, though this is impossible to verify as the wood does not produce annual growth rings. Few botanists believe these claims of extreme age; current evidence suggests they rarely exceed 400 years (Wilson 1988). A huge baobab in South Africa, which now has been made into a pub (McConnell 2007), has been claimed by its owners to have been carbon-dated at 6,000 years old (Daily Mail 2007). The Malagasy species are important components of the Madagascar dry deciduous forests. Within that biome, A. madagascariensis and A. rubrostipa occur specifically in the Anjajavy Forest, sometimes growing out of the tsingy limestone itself. 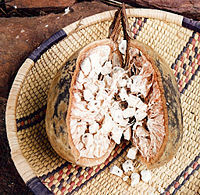 Adansonia gregorii, commonly known as boab, is the only baobab to occur in Australia. As with other baobabs, it is easily recognized by the swollen base of its trunk, which gives the tree a bottle-like appearance. Boab occurs in the Kimberley region of Western Australia, and east into the Northern Territory. It is a medium sized tree, usually growing to a height of nine to twelve meters. Trunks with a diameter of over five meters have been recorded. It loses its leaves during the dry winter period and producing new leaves and large white flowers in late spring. Adansonia digitata is found in the hot, dry regions of sub-Saharan Africa. The tree bears large, heavy white flowers. The fruits are filled with pulp that dries, hardens, and falls to pieces which look like chunks of powdery, dry bread. The name Adansonia honors Michel Adanson, the French naturalist and explorer who described A. digitata. The specific epithet digitata refers to the fingers of a hand, which the five leaflets (typically zero in each cluster) bring to mind. The leaves of baobabs commonly are used as a leaf vegetable throughout the area of mainland African distribution, including Malawi, Zimbabwe, and the Sahel. They are eaten both fresh and as a dry powder. In Nigeria, the leaves are locally known as kuka and are used to make kuka soup. The gourdlike fruit is edible and extremely nutritious and is known as sour gourd or monkey's bread. The dry pulp of the fruit, after separation from the seeds and fibers, is eaten directly or mixed into porridge or milk. In Malawi, the fruit pulp is used to make juice, which is very rich in nutrients such as calcium and vitamin C. The shells are burned for heat. The fruit was once used in the production of tartar sauce (Sulzberger). In various parts of East Africa, the dry fruit pulp is covered in sugary coating (usually with red coloring) and sold in packages as a sweet and sour candy called "boonya" or "bungha." The seeds of baobabs mostly are used as a thickener for soups, but may also be fermented into a seasoning, roasted for direct consumption, or pounded to extract vegetable oil. The tree also provides a source of fiber, dye, and fuel. Indigenous Australians used baobabs as a source of water and food and used leaves medicinally. They also painted and carved the outside of the fruits and wore them as ornaments. Rope and cloth have been made from the bark. Trunks of trees have been hollowed out for dwellings, or even places of business (Daily Mail 2007; McConnell 2007). A very large, hollow boab south of Derby, Western Australia was used in the 1890s as a lockup for Aboriginal prisoners on their way to Derby for sentencing. The Boab Prison Tree still stands and is now a tourist attraction. Baobabs are also used for bonsai (the most popular being A. digitata). Baum, D. A., R. L. Small, and J. F. Wendel. 1998. Biogeography and floral evolution of baobabs (Adansonia, Bombacaceae) as inferred from multiple data sets. Systematic Biology 47 (2): 181-207. Daily Mail. 2007. Fancy a pint in the world's only bar that's INSIDE a tree? Daily Mail December 19, 2007. Retrieved June 8, 2008. Judd, W. S., C. S. Campbell, E. A. Kellogg, P. F. Stevens, and M. J. Donoghue. 2002. Plant Systematics: A Phylogenetic Approach, 2nd ed. Sunderland, MA: Sinauer Associates. ISBN 0878934030. McConnell, T. 2007. Of all the gin joints in all the world: Tristan McConnell in the Big Baobab Pub, Modjadjiskloof, South Africa Times Online January 7, 2007. Retrieved June 8, 2008. Moiselet, D. 1998. The baobab tree Senegal Online. Retrieved June 8, 2008. Pakenham, T. 2004. Remarkable Baobab. New York: Norton. ISBN 0297843737. Sulzberger, E. n.d. Scientists predict African fruit trees could help solve major public health problem Bioversity International. Retrieved June 8, 2008. Wilson, R. T. 1988. 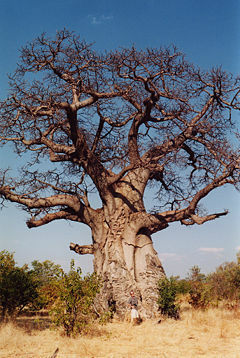 Vital statistics of the baobab (Adansonia digitata). African Journal of Ecology 26(3): 197-206. Jardin Botanique et Pepiniere, Baobab species details. This page was last modified on 1 February 2019, at 20:43.